The program, which was launched on Tuesday in an initial test phase, requires users to pay for the movies using Facebook’s on-site currency, called Credits. Warner Brothers is now offering movies to rent or buy via Facebook. 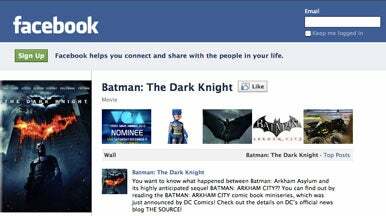 The films will be available on their individual Facebook Pages, starting with a Batman film, The Dark Knight , which costs $3 to rent. In addition, letting its extremely hooked and loyal users watch full-length movies on the site is bound to boost Facebook’s already robust usage metrics. According to comScore, in December Facebook unique visitors for the month grew 38 percent year on year to 153.9 million in the U.S., while total time spent on the site spiked 79 percent to almost 50 billion minutes. It’s not the first time that full-length, professional video is available on Facebook. In 2009, NBC debuted its show Community on the site, and Hulu launched an application for watching NBC premieres. “Right now, more than 400 games and applications use Facebook Credits to give people a convenient and safe way to buy virtual and digital goods on Facebook. We’re open to developers and partners that want to experiment using Credits in new and interesting ways, and we look forward to seeing what they come up with,” a Facebook spokeswoman said via e-mail when asked for comment about the Warner Bros. announcement.